A long time ago I dated a charming young man from England. We’ll call him Sandy. The first real date we went out on he took me to see a Michael Caine movie called Educating Rita. I never suspected he was interested in me. But after he was no longer my student, I started running into him in between classes, or he would show up in The Pit, just wanting to say hi. One day he asked me out in that irresistible accent of his. In those by-gone times, since he was no longer officially my student, such things were considered okay. Stunned, and flattered, I said yes. I suddenly saw how cute he was. My time with Sandy lasted only a few months, but there was an enduring sweetness to it that pervaded even the kind way we parted. Underneath our differences, we just liked each other. He had played rugby, and loved football and very fast cars. I preferred to walk on the beach with my dog, and was hard pressed to remember even the basics of either game he loved. On the food front, Sandy didn’t like any vegetables but white potatoes, or any nuts, or even any jam with pieces of fruit in it. His favorite foods were smooth milk chocolate and red meat. Even then, these tastes were such a stretch for me to appreciate (I tried to avoid both). And I began to see how this difference was going to be a significant obstacle. And like many young women enjoying a romance, I tried to ignore it. I was a long way away back then from learning to recognize it was possible to educate myself to like and prefer the taste of foods that actually made me feel better rather than the taste of those that didn’t, no matter how pleasantly addictive they might be. To be fair to Sandy, I was as entrenched in steeping my vegetarian plate with eggs and cheese as he was intent on meat and milk. But somehow I instinctively knew I could never live on red meat, white potatoes and milk chocolate. A life without fruits and vegetables was hard to even imagine. And a day to day life with someone who had no interest at all in either seemed almost as hard to envision. Maybe our old tastes are often like old loves that we know won’t work out, but we keep coming back to anyway, in different guises, hoping this time they will. I certainly did that repeatedly when it came to wheat and flour products, tweaking and hoping (and contorting my intestines in the process), trying to make it okay to eat what everyone else seemed to be eating and doing fine with. I now know it’s not true that everyone else is doing fine, but, like I said, old tastes don’t like to let go. Or maybe it isn’t the tastes. Maybe the tastes are like Sandy and me, just knowing that though we enjoy this, we could easily enjoy something that was a better fit. The trick is getting to the place where we can see such change is possible. Food tastes themselves DO change over time. Some say it takes about two weeks, some say four. Maybe it’s more mysterious and less predictable a time frame. But when they DO shift, a sense of euphoria and adventure sets in. There’s almost a high that comes with really being able to taste things. I can remember sitting at the kitchen table eating slices of pink grapefruit and marveling that they tasted as sweet or sweeter, and more real than the pleasure of Squirt soda or Fresca once tasted to me. And were a bejillion times better for me. How could this be true? But it was. I was practically ecstatic. In my euphoric enthusiasm, I often forget that the taste buds of those around me eating a more standard diet have not shifted their sensitivities away from salt, sugar, and fat. 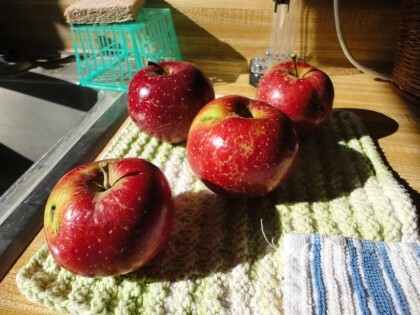 The apples from the tree down the alley that were so sweet to me tasted like cardboard to the friend and her husband who had helped me pick them. This truly confused me. Perhaps they just really did get ones that tasted like cardboard. But it reminds me I am now living in a different taste universe. I was reminded of it again when, graciously adventurous, they tried my pumpkin pie recipe for Thanksgiving. My friend had never cooked with fresh ginger root before. I had insisted she take some fresh ginger home to put in the filling, because to my way of tasting it “makes” the recipe, and I really wanted her daughter-in-law and nephew, the two who needed to be gluten free, to like the pie. I found out afterwards they had politely dubbed it “interesting.” Ah, well. Another good e-mail pal astutely refers to experiences that reveal her old mental programming as “educational,” when she strives to replace it with newer, healthier thinking patterns. Perhaps the same endeavor can be applied to tastes as well. We recently had a humorous exchange about this possibility when she tried buckwheat groats for the first time. She followed the cooking instructions in my post to a tee, and wrote me they came out perfectly. But to her, they tasted like mothballs! We both got a good laugh out of this, since neither of us have ever actually tasted mothballs, of course. But somehow I knew what she was talking about. Did this mean I liked the taste of mothballs? We laughed again when she sent me a blog entry she’d found for hiding buckwheat groats in some yummy sounding muffins. The groats tasted like “dirt” to this blogger when she tried to eat them plain. Now the mothballs I can imagine somehow. But the dirt? That’s a stretch for me. It puts me in silly mind of one of my favorite scenes from one of my favorite silly movies, an Albert Brooks satire of the hereafter called Defending Your Life. Daniel, the main character played by Brooks, has been hit by a bus and killed instantly. He finds himself in a place called Judgment City where it’s 74 degrees and sunny all day every day. People who die come to review their lives to decide whether they are smart enough to “move on” or if they need to go back to earth to learn how to deal with fear (People on earth are so busy dealing with fear they use only between 3-5 percent of their brains). One of the perks of Judgment City is that while humans are undergoing the “stress” of this review process they can eat as much of any food they like. It will taste like the best whatever-it-is they have ever had, and they won’t gain any weight or have any indigestion. At his first meeting with the guide that will help him through the review process, played by Rip Torn, they go out to lunch. Daniel is munching away on roasted chicken, but he gets curious about the strange brown clumps on his “lawyer’s” plate. He’s told it’s “resident food” and he wouldn’t like it. But he’s so curious that his “lawyer” says he likes that about him and to go ahead and try it. He takes a bite and spits it out, exclaiming, “This is what smart people eat?? ?” His “lawyer” laughs and says tastes kind of like. . well, you know what he says. Then he cautions him. “Until you get a little smarter and learn how to manipulate your senses, you don’t want to eat this stuff.” I sometimes get to laughing at myself that even though I seem like such a smart person, the food I’m now raving about looks (and tastes) closer to those “clumps” to people who haven’t made a taste bud shift away from their usual loves. Nevertheless, there’s hope for all of us to educate our taste buds to work for us instead of against us, and love doing it. Even childhood aversions can change. For me, it was persimmons. Their texture was almost frightening to me. I also hated gooey dark sweet bread they were made into. Susan’s wonderful post about them Persimmons and Frozen Persimmon Sorbet came somewhere along the line of my plant-based learning curve, and like Daniel, I got curious. Now I’ll eat them plain, like candy, or cut up into my bowl of raw rolled oats and buckwheat groats and almond milk. Another childhood food aversion from a good friend comes to mind. I watched his Spinach Overcooked in Beer episode transform at my dining room table. As a little boy, his Dad had made him sit at the table until he finished it. Rather than eat the foul tasting overcooked spinach, instead he sat there until he fell asleep. He recalled this memory as he became amazed to discover how much he was enjoying my sautéed greens with sweet potatoes. He had not known they could look or taste any other way than the one his Dad considered “gourmet” but that he couldn’t stomach back then. We probably each have a story or two like this in our own food memory banks. The good news is that now we’re grown-ups, and can remake our taste bud destinies. We can learn to eat outside of the old processed box, and right out of the CSA box. Sometimes, though, aversion is built into the actual taste buds genetically. As in the case of cilantro. Apparently some people have a gene that makes it taste like soap to them. No wonder they don’t like it. Perhaps some day we’ll find that some people carry a gene that makes buckwheat groats taste like mothballs. Or dirt. But until then, it’s probably not a bad idea to educate those taste buds back to as many fresh whole foods as we can, and get high on fruit that tastes like soda, or discover the subtle earthy sweetness in whole grains. I’d rather not keep my own taste buds in “mothballs” unless it’s absolutely genetically necessary. The teacher in me still hopes others will at least consider “tasting the rainbow” with those of us who are well into chomping away at it. Here’s a good soup from Susan, Eat the Rainbow Black Bean Soup, for starters. There IS a pot of gold at the end. I’ve tasted it. Such a flexible essay! I find myself feeling like I can bend all directions now that I see how those directions might be flowing. What you write about taste buds changing is true for me and my family. My dear girls who changed to help me with my health, yet still desired cheesy, greasy, meaty foods, are now refusing pizza when out with their friends because it makes them feel sick, because it is so greasy and they get it all over their fingers and hands, because it makes them break out later. Now the pizza has the cardboard taste and the no-cheese, fresh veggies, no oil pizza at home is bright, refreshing, and satisfying. Have a great day and thank you for sharing your experiences with us. You’re welcome, Ellen! So glad this spoke to you. I loved hearing about the change for your girls, too. It really can happen, and it’s pretty wonderful when it does. I have learned things yet again Maria – every time. A gene causes my friend Eddy to spit out cilantro – — very much to his amazement and everyone elses — when it happened at a potluck! Really, he has impeccable manners – just bad genes. His Mom will get a kick finding out it is the parents fault after all! And who knew how to spell bejillions – I do now. As for how cool it is to have taste buds again, it’s amazing! I actually do like cheesecake though a lot – but I have recently had fruit desserts I wouldn’t think of trading for a slice. Ginger in pumpkin pie sounds fabulous too!!!!! Michelle, I laughed out loud reading your comment, especially the part about how to spell “bejillions”! Thank YOU for such a great reply. Here’s to falling in love with fruit desserts over cheesecake, too! Interesting – what became of Sandy? Well, I’m not sure. The last time I saw him was a long while after we parted. It was a nice meeting. He was near graduation and had a good job prospect ahead of him, and I was newly pregnant with my son. We were happy for each other. We joked about “penciling each other in” for lunch Southern California style, but we didn’t get together after that (also in Southern California style). You’re welcome, teri. Everyone of us has been at his or her own version of where you are now. Hang in there, and know I encourage you along in your learning curve. Thank you for sharing a bit of your struggle here. Your writing is beautiful, Maria! On the topic of cilantro… I used to always quote the genetic differences study in describing why I hated cilantro. Anything more than the tiniest amount and the whole dish tasted soapy. But somewhere along the line things changed and now I absolutely love it and can’t get enough! So go figure. I know that Susan is one of those people who is really averse to cilantro and I keep thinking of emailing her and telling her not to give up. I’m so happy to enjoy it now! Hi Valerie! Actually, by forcing myself to taste it once in a while, I’ve managed to become more tolerant of cilantro. It tastes less like soap now, and I’ve even added small amounts of it to dishes that call for it, though never the full amount. It still doesn’t taste “good” to me, but at least I’m making progress and don’t have to avoid dishes that contain it. Maybe one day I will get to the point where I love it like you! Thank you, Valerie! And wow, your cilantro transformation is amazing! It’s an fascinating footnote to the nature/nurture puzzle. I love that scene from Defending Your Life! Your post is so true, and really made me smile. Thanks! Thanks AmyLu! So glad you loved the scen from Defending Your Life. It really helps me keep my sense of humor, too. I know exactly what you mean about how food taste. My diet is no where near as pure as yours yet there are things I simply can not eat anymore. I used to crave cheese, and now it smells to me like something rotten. (which I suppose it is) . The other day the office got pizza , I had a vegan pie. I could only eat 2 pieces because it was so salty! Love your writing. btw I love buckwheat groats. Thanks, Marge! It’s always heartening to hear that others taste buds are moving in the same direction as mine. And good to have another buckwheat groat lover reading along. Oh my gosh, Maria! I know what you mean, I do, I do, I do!!! I am constantly tasting things no-one else does! And loving them while everyone else is looking at me like I am crazy or like they pity me. Like AmyLu, I loved that scene in Defending Your Life, too. Haven’t thought about it for awhile….nice to think we are “smart,” LOL. I loved “Educating Rita” too. Willie Russell the writer has so much insight into the ways of the workings of women’s minds. You might know that he also wrote “Shirley Valentine.” Did you know that they wanted Cher for the role? I’m sure she would have been very good but I’m glad that Pauline Collins got the part instead. I’m married to a Sandy type and yes it can get a bit difficult at times…and we’re both English!